I first met with Naomi and Oliver (Ollie) almost two years ago, when they were still in the very early stages of planning their wedding. They had some amazing plans for their big day, which included the bride's arrival at the wedding venue (the Holt Fleet in Worcestershire) by boat. Unfortunately, due to the hottest summer on record, the river level was so low that once at the venue, the bride wouldn't have been able to have gotten out of the boat! Unfortunately this plan was scuppered, but Oliver's plans for a 'big photo' as I call them, were not. The Holt Fleet is a cracking pub/restaurant that's right on the banks of the River Severn, set in 14 acres of it's own land. The bar stocks a range of beers, and the kitchen produces some truly amazing food (and an awesome cappuccino to boot.) However, the venue is a little short on space when it comes for areas for wedding photography on an epic scale. In the month before the wedding, I had a real think about where I could take one of my 'big pictures.' I envisioned stopping traffic on the road bridge over the river, at night, with car headlights illuminating the bride and groom. I pictured having the couple on a boat under the bridge on the river with an elaborate lighting set up, the list goes on. However when it came to it, I soon realised that all of my plans were a little out-there and wouldn't be possible on the day. As the evening reception got underway, I could still hear Ollie's words ringing in my ears that he wanted that one special photo. I was beginning to think we wouldn't get it - that is, until the heavens opened about 20 minutes before it would be too dark to take any photos outside at all. I found Naomi on the dance floor, and asked if she still wanted to go to the field. To my amazement, she said yes! When I asked Ollie, he also agreed and I knew that I had to nail the shot now. You really can't afford to drag the couple away from their reception for 20 minutes, make them stand in the pouring rain and then not deliver the all important photo. One of the non-drinking groomsmen gave us a lift to the field. It was now or never - I put a flash in the field and pointed it back towards me, with the bride and groom at this time still sheltered under some trees. I mashed some settings into the camera as I say (a rough guess as to what I might need) and took a test photo. When I was ready, I positioned the bride and groom where I wanted them and took a single photo. It was incredible, but I'd made the wrong choice with the 85mm lens that I was using; there wasn't enough empty space in the image, it was too close in on the couple. I ran back to my camera bag at the car and swapped it out for a 50mm lens. At that very second, the light rain turned into a downpour. I now had one chance, one photo and it had to be in the next 20 seconds before the bride and groom got drenched... 'Kiss each other and hold it' I shouted, as I knelt down and took a photo. A quick glance at the LCD screen confirmed it was in focus, and I knew I'd done it. We got the bride and groom back in the car before I showed them the image. They were wet, they were cold and tired - but they were also ecstatic with the photo! 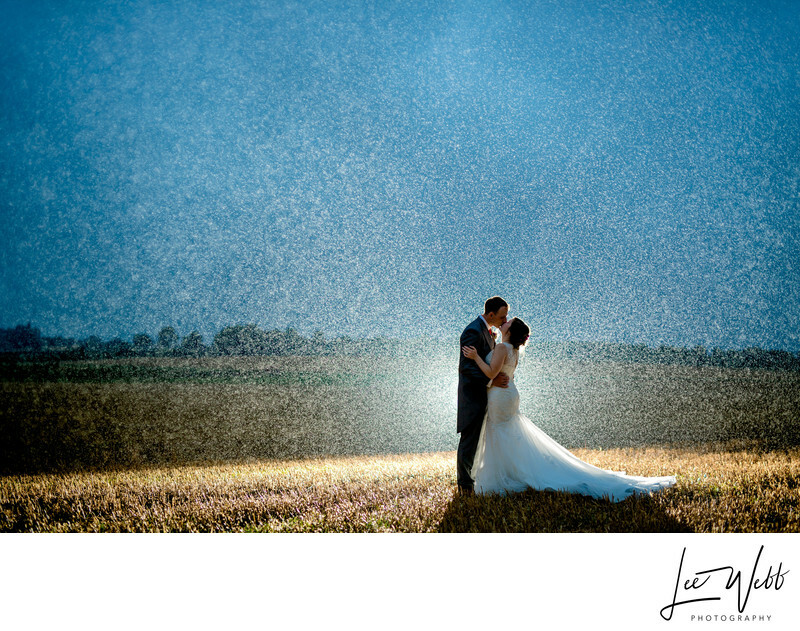 Two years of planning and worrying about this photo, and it came down to 20 seconds in a torrential storm, in a field in the middle of nowhere.